Get inspired to make something wonderful as we chat with eminent lino printer Kim Raymont! Kim Raymont is a locally-based artist who specialises in the traditional methods of lino printing and letterpress. Inspired by her love of typography, she founded her own company, Something Wonderful Design, in 2010 to enable her to hand-make beautiful and bespoke prints for her customers. 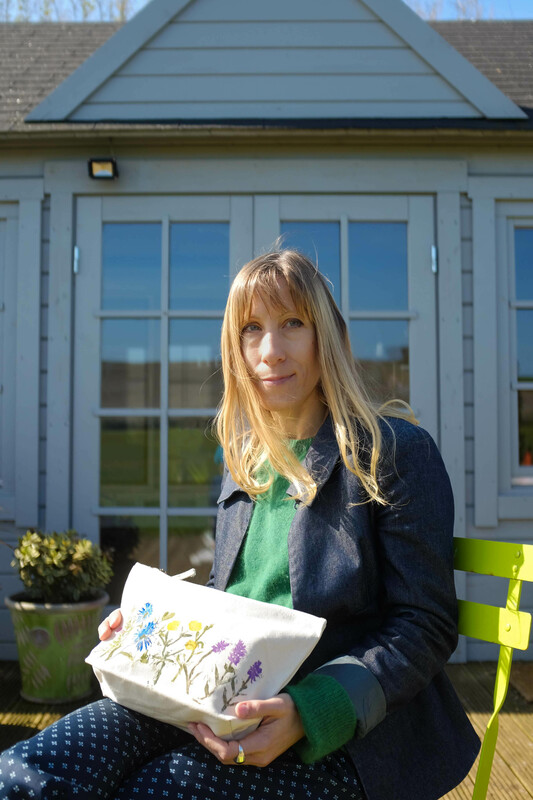 We’ve been showcasing Kim’s work in our shop for a while now but this year we tasked her with devising a cosmetic bag, incorporating a design that would represent the flowers that can be found in our wildflower meadow. We’re very happy to report that Kim accepted our commission and her unique range of bags will be on sale when we open. 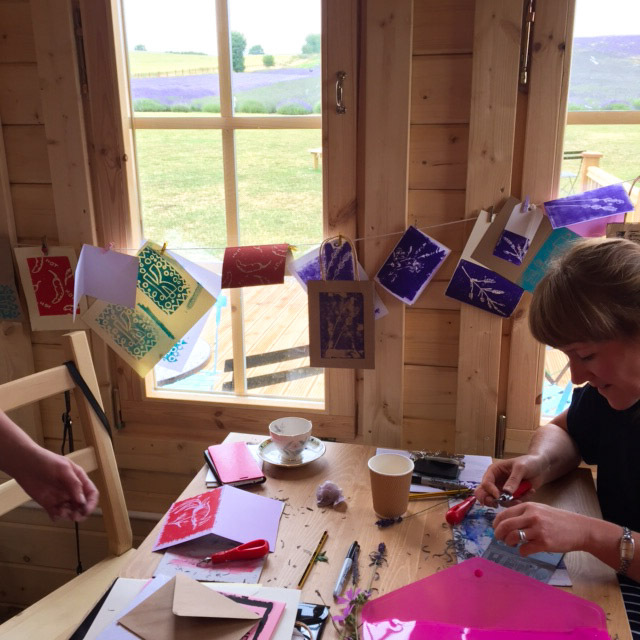 As well as creating her own art, Kim also teaches the art of print making at various venues, including here at Hitchin Lavender. 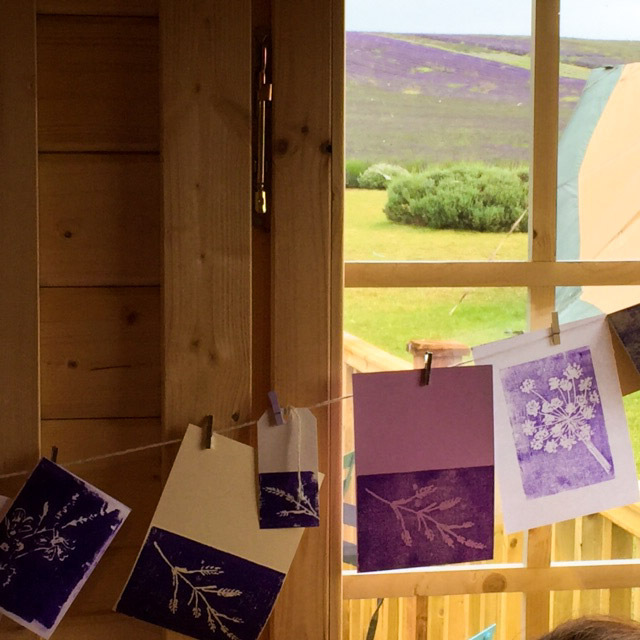 In case you may be tempted to try your hand at print making yourself, we thought it could be useful for Kim to tell us a little more about her background and to explain the basics of lino printing. It’s a type of relief or block printing, which means carving a design into a sheet of lino using lino cutters, applying ink using a roller, onto the block and then taking prints. The areas which have been carved away remain the colour of the paper, and the areas left raised, will print in whatever glorious colour you have chosen. Prints can be simple – they can be just one design, in a single colour using one block, or can be made very complex by carving several blocks which can be printed on top of one another; or by carving the same block and inking/printing from it in successive layers. Can anyone have a go? Absolutely! There are lots of different types of lino, which have different benefits and possibilities. Children can do “lino” printing by drawing onto a foam block with nothing sharper than a pencil – a print can then be taken from the inked block in the same way it would be taken from a linocut. 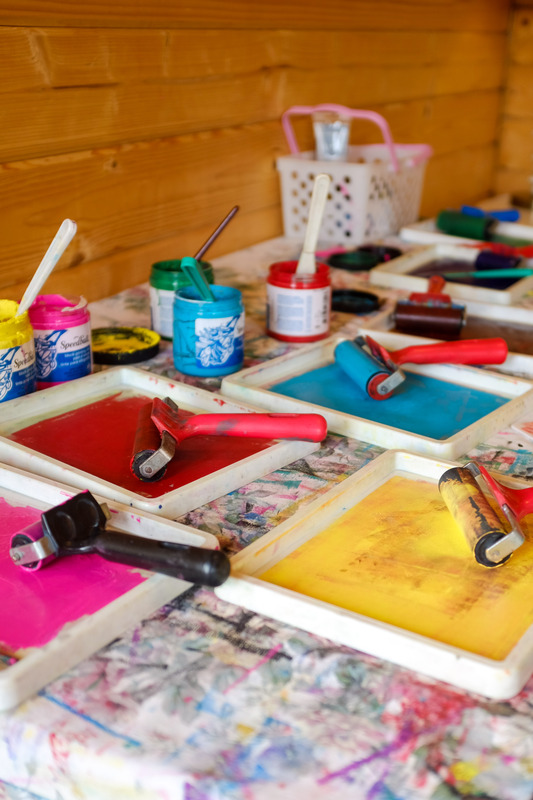 You don’t need to be able to draw to start print making, as you can transfer a design from a printed template (this could be anything from a piece of wallpaper to a print out of a picture). You then carve the transferred drawing, and away you go. I have always loved drawing, sketching and doodling, so in that sense yes I have always been an artist (I believe children are born artists). I first encountered lino printing at school, as many people do, and although I’ve used lots of other media to make work – photography, drawing, painting and sculpture – I always return to print making. Well, one idea tends to lead to the next. It’s best to go with your instincts with art, if you are excited by something then that is the thing you should bring into your work. For me that’s places, words, and the colours of the natural world but for others it might be people, animals or simply abstract patterns. It’s never wrong! Do you teach any other type of art or have aspirations to? I don’t currently teach anything other than lino printing as I’m studying for an MA in Illustration and Book Arts. In between studying, making my own work, teaching lino print and looking after my kids there isn’t really time for anything more. However I’d love to teach art to children at some point in the future. What difference does it make teaching in the cabin? 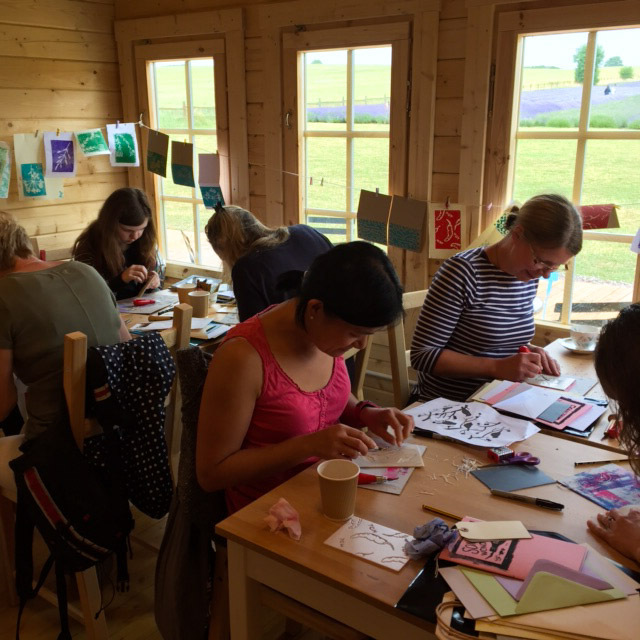 Teaching in the cabin at Hitchin Lavender is such a privilege as it’s a really special space. As well as the incredible views, it feels like a really magical venue in which people can really relax and let their imaginations take flight. With the botanical theme of my workshops this year, it is doubly appropriate as inspiration is literally under our noses! 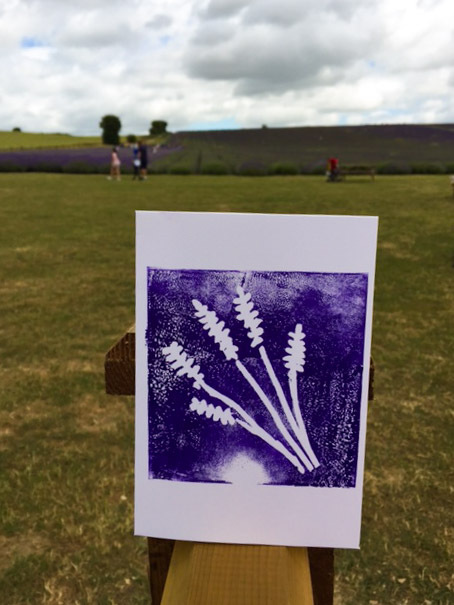 If you would like to experience print-making first hand, please book your place by visiting our Hitchin Lavender events page or contact Kim directly at Something Wonderful Design! Also, be sure to check out Kim’s Instagram and Twitter!